As states have begun to legalize marijuana, its use has been more openly discussed. While the effects of other commonly used drugs, such as alcohol, have been studied extensively, the effects of marijuana – especially on developing babies during pregnancy – have been much less studied and less widely publicized. This relative silence from the scientific community has affected the public’s opinion on the safety of marijuana: 70 percent of U.S. women think there is “slight or no risk of harm” to the baby from using marijuana during pregnancy. Expectant mothers may use marijuana rather than prescription drugs during pregnancy to relieve pain because they feel “natural” or home remedies are a safer option than prescription drugs. However, just because something is “natural” doesn’t mean it is any safer or a better alternative to well-studied prescription drugs. This seems to be the case for marijuana. Given that marijuana is the most commonly used illicit drug during pregnancy, understanding its risks and impacts on the developing fetus is important. Three large-scale longitudinal studies tracked how maternal cannabis use affected their child’s development, and they have had surprisingly consistent results. The Ottawa Prenatal Prospective Study surveyed 700 pregnant women who used marijuana in 1978 and has followed about 200 of those children into adulthood. The U.S.-based Maternal Health Practices and Child Development Study has studied 580 children of marijuana users from pregnancy through age 14. The Generation R study is tracking almost 8,000 children in the Netherlands. Children of marijuana users were more impulsive and hyperactive, and exhibited behavioral issues, lower IQ scores, and memory problems when compared to children of non-users. These mental health problems persisted through their teenage years, where they were significantly more likely to have attention problems and depression. Marijuana-exposed children were also almost twice as likely to display delinquent behavior, such as drug use, by the age of 14 and were more than twice as likely to regularly use marijuana and tobacco as adults. 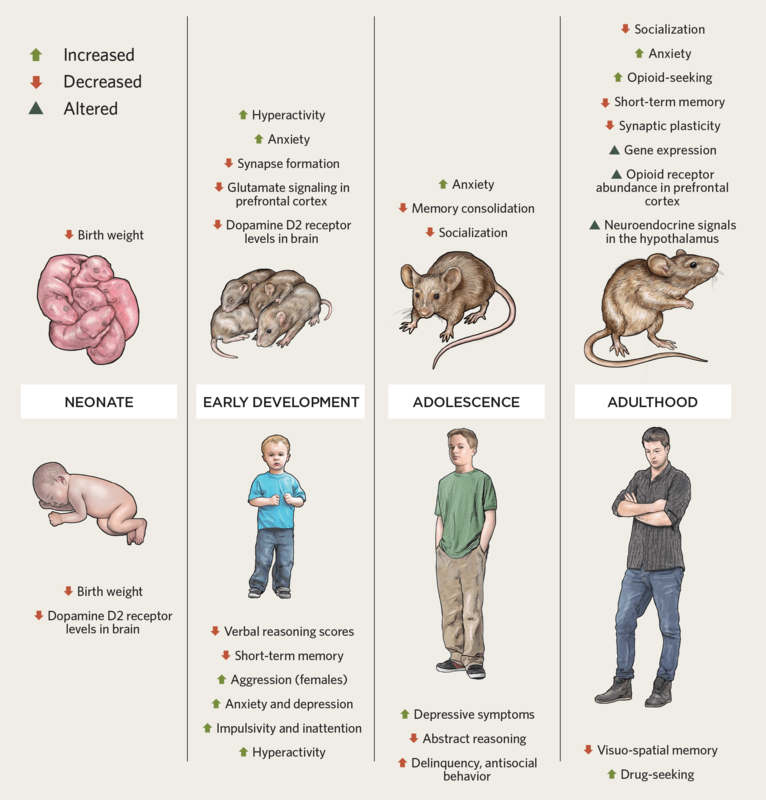 The very consistent results between mice and human studies (summarized in the infographic from The Scientist below) highlights an increasing understanding of the impacts of marijuana use on development. It’s important to note that some behavioral outcomes may not be completely related to fetal marijuana exposure. Children of marijuana users may have grown up in a different social environment with more lax views on drugs, contributing to their increased drug use. As marijuana continues to be legalized, we should expect to see more studies on its health effects and safety. I’m curious how many if these mother’s had underlying genetic-based anxiety or ADHD related conditions themselves. How much is genetic-based vs exposure related.